Gabriel Beaudoin (born 1992) is a juggler from Quebec, Quebec, Canada. 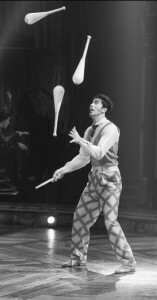 He attended École nationale de cirque in Montreal. He is best known for his work with Cirque du Soleil, performing in their show Kurios. This is one of Gabriel Beaudoin’s performance clubs used in Kurios. Donated by Gabriel Beaudion.